A quick revving hybrid when you want to control the backends. Won’t spend much time on drilling as this will vary and coverstock accounts 75% of the reaction. As usual, I suggest to work with your local pro to find what best works for you. This is a very early revving ball which appears to offer a ton of control. It does not feel like a grip it and rip ball for those who like to hook the lane. It seems to be done revving by the midlane, which makes it very smooth and controllable at the breakpoint. In the out of box surface prep, I was a little surprised that it was more suited to medium than heavier oil conditions. At the right time, this ball can offer a fantastic control option. It’s a high end offering from Motiv and thus it is quite expensive. For some reason, it is a bit more expensive than the average top of the line ball from other manufacturers. There’s not much more to add. If you like the ball and it is a good fit, a couple of dollars won’t be a deal-breaker. This core is as strong as they come. It has a 2.48 RG, a Differential of 0.060 and a mass bias of 0.030. I think the differential and mass bias is as strong as allowed by the USBC. It is plainly obvious how strong the core is when thrown. The core gets into its roll very early. This provides outstanding control of the midlanes and moderate backends. This is a hybrid coverstock, meaning it is part solid and part pearl. In general, I find it to compliment the core. You can look at this in different ways. I felt like the cover doesn’t have as much teeth as I thought it would. My initial thought was this is the kind of ball I could use to bite through the fresh shot and give me control. However, I found it suited more to when you need to control the midlane and the backends are hooking. If the backends aren’t clean, there isn’t enough energy storage for this ball to make a move. That’s because the core is spent in the midlane. Based on that, I found it more suited to the medium volume shot, at least in the out of box surface. You could take the surface down beyond the 2000 wet sand which will provide more bite in the midlane. That would probably give you a better look on higher volumes of oil. The cover seems to shine itself up a bit with games played so you may need to take it in for fresh surface every now and then. This ball has a reaction which is completely different than any of my recently tested equipment. The core is very dynamic. In that regard, I found this to truly be a control ball. Usually balls with aggressive cores go with aggressive covers. That tends to make them useless when shots breakdown. However, I didn’t see that with the Cruel. In fact, the reaction was sweeter after several games which is a testament to the length the cover creates as a hybrid. This is not a ball that you necessarily want to swing big, as is typical with more aggressive bowling balls. It uses a lot of energy up front so you generally want to play a little more direct. A lot of people locally have had great success with this ball and almost all who do throw it pretty direct. It has just an outstanding midlane read which is super-easy to read. The backend reaction doesn’t generally surprise you because of that. It rolls very true. The ball also doesn’t overreact to dry boards. Again this is due to the overall reaction. 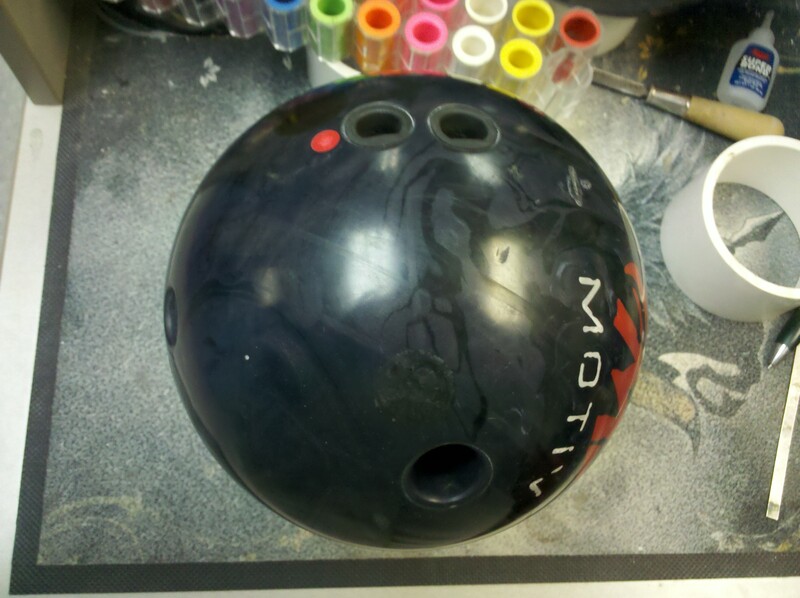 If you’re looking for a booming ball, look elsewhere. If you are looking at getting to the pocket all the time with a consistent reaction and good energy at the pins, you can stop here. “Pocket sniffing ball”… Good way to put it. I have to agree. This ball reads so early that it’s easy to see what it will do half way down the lane. It isn’t erratic on the backend, hence not as prone to over/under. A lot of people have a very good look with this ball on medium to medium/light conditions. u bet hoss just found out a buddy needs me to bowl sub for his squad tomorrow:) im normally a little looser subn and hope to pull big numbers,and for some reason they tend to put out more oil for the wends league than my thurs league,weird but several people that bowl both say it too…so weeeee!! u bet hoss just found out a buddy needs me to bowl sub for his squad tomorrow:) im normally a little looser subn and hope to pull big numbers,and for some reason they tend to put out more oil for the wends league than my thurs league,weird but several people that bowl both say it too…so weeeee!!! Tamer – If I didn’t actually see you throwing this ball on video, I would have thought the review was based solely on my performance Vs your Monday night team a few days prior to your review. Please don’t call me a “local” in person. Seriously, your review is very accurate based on the 40+ games I have with this ball. You probably have a decent read on my game and this ball with the proper drilling has been overall very well suited for BV’s conditions. I have med low revs, a ball speed right around 19mph, and play an old fashioned 2nd arrow “down and in” line. In the past few years, I have found that aggressive balls with overly aggressive drillings get me into trouble with splits I simply can’t make, or I leave too many 4 pins. I have gone back to smoother arc drillings and my average has seen the impact in a positive way. My season last year with the smooth arc Hammer Bite was something out of a sci-fi movie. Anytime someone asks my opinion on a type of ball or a line to throw, I always say straighter is greater and get rid of the crank or big flip. I drilled my Motiv Cruel with the middle finger directly on the pin and left it at the box 2000 grit sanding, which is the grit I prefer to throw regardless of drilling. This provides a nice smooth arc rather than an aggressive hookl. When I miss left, its usually due to a fast arm swing and the smooth arc is usually forgiving enough to hold the oil and avoid splits. If I miss right, because of the smooth arc, I tend to hit light pocket rather than it screaming back to the pocket like house crankers will see happen. I still stay out of trouble but might see a 2 pin standing or 2-8….still makeable spares. I agree with you 100% that this is a very good “control” ball which is great for those with accurate shot making abilities. 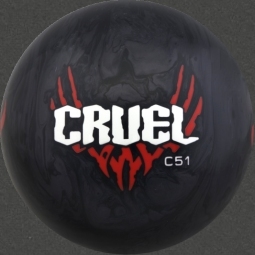 BUYER BEWARE if you’re one who relies on “free strikes” with a ball that has a pocket seeking device 10-15 boards wide, especially if you tend to miss your mark to the right. Hey John. Happy to see you on here! I love the way you throw your Cruel. You obviously have it pretty dialed in to the game you have in our house. I absolutely agree with you, generally speaking, straighter is greater. As you can guess, “straighter” is a relative term, but I think it almost always holds true. The fewer boards you cross right to left and back, or vice versa for lefties, the less there is to go wrong. I completely understand you sticking with 2000 grit most of the time. Being speed dominant, you can overcome the extra traction that finish provides, while giving you a smooth read towards the pocket. Polished balls would probably have a pretty flaky reaction for you at BVL. Anyway, keep shooting those big games! See you Monday.